Could humans one day live to 1,000 years? 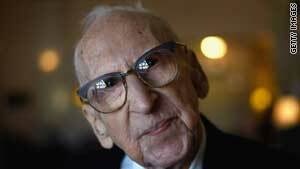 Walter Breuning is the world's oldest man at 113. Find out how you too could live as long as him. (CNN) -- CNN's global health show Vital Signs has teamed up with world renowned anti-aging experts to bring you an in-depth discussion on the search for immortality. Vital Signs host and CNN Chief Medical Correspondent, Dr. Sanjay Gupta will be joined by best-selling author Dan Buettner who has done extensive studies on the areas in the world people live the longest, healthiest lives, known as Blue Zones, and shares their formula for a long life. The other panelist is geneticist Dr. Aubrey de Grey, best-selling author of "Ending Aging: The Rejuvenation Breakthroughs That Could Reverse Human Aging in Our Lifetime." He believes regenerative medicine could, in a matter of decades, extend life expectancy to 1000 years.